"There are at least 1000 guitarists for every steel-guitar player." 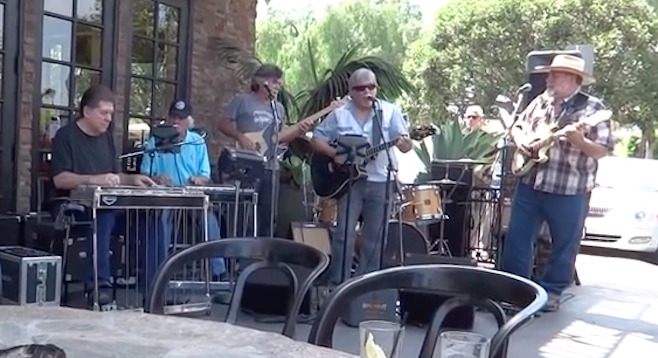 When retired veterinarian Jim Palenscar opened the Steel Guitars of North County store 15 years ago, he knew his storefront was destined to be more about personal gratification than a business slam-dunk. Sunday, November 26, 2017, 1 p.m. to 4:30 p.m.
Because he’s survived in business, “Many of my heroes are now my customers.” Last week Lucky Oceans, one of the founding members of Asleep at the Wheel who now lives in Australia, stopped in to his shop in an Oceanside strip mall. Nils Lofgren (Bruce Springsteen), Dean Parks (Steely Dan, Neil Diamond, Stevie Wonder), Pete Anderson (Dwight Yoakam), Greg Leisz (Jackson Browne, the Eagles), and Bruce Bouton (Garth Brooks) have all dropped by his Mission Avenue store located between a donut shop and a martial arts studio. Palenscar has taught himself how to repair lap and pedal-steel guitars, instruments that give the emotional twang to many country songs. He also gives lessons to students who are patient enough to learn the instrument. He says a basic model starts at $1200. Three years ago Palenscar opened a small manufacturing company on Oceanside Boulevard to house Goodrich Volume Pedals which he took over. Dec. 9, 2017 @ 8:28 p.m. Even tho I don't get up to see him much it's good knowing he's there. Jim is a real stand up guy. Or in this case a sit up guy. :-) PSG forever!